Face steamers are very easy devices to use in that you simply add water to a small reservoir in the base of the unit and turn it on. After a couple of minutes the water is heated to a temperature where steam is produced and gets funnelled up the steam mask. The device will tell you when it is hot enough to use and at this point you place your face over the steam mask and let the steam go to work on your skin. Some face steamers will come with a timer to allow you to monitor how long your session lasts. You may find that the steam is too hot for your face on occasions but all you need to do is raise your face an inch or so till it becomes comfortable again. Many of the devices also come with a nasal mask / steam inhaler which allows you to direct the steam specifically up and around the nose area. The reason for this is that that these steamers have been found to be fantastic for reducing the affects of coughs, colds, ear congestion, sinus problems and even more severe chest issues such as asthma and bronchitis. Read the reviews of any products and you’ll see loads of first person stories of how it’s helped them and was recommended by their doctor or nurse. Lastly, some of the more expensive facial steamers also come with rotating facial buffers with interchangeable brush and sponge attachments to really deep clean the skin after the steamer has opened your pores. What Does a Facial Sauna Actually Do? The steamer benefits you skin in a couple of ways. Firstly it works by bringing oxygen and nutrients to the surface of your skin so that it feels softer and appears healthier. Secondly it is incredibly effective at opening the pores in your skin so that you can do some really deep cleaning to make your skin look great and reduce issues such clogged pores that cause blackheads and spots. 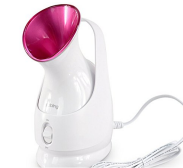 As mentioned above they have been proven to be incredibly effective for easing respiratory problems and is a primary reason many people actually buy a facial steamer. If that is what you are buying one for then ensure that you buy one with nasal face mask. 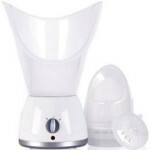 Which Face Steamer to buy?